The calendar and the weather outside tell you that summer is now in full swing and everyone should be taking advantage and getting out on the lake and wakeboarding, whatever it takes. School's out so that's no excuse. If you have a job, leave early or take a vacation. Or quit. 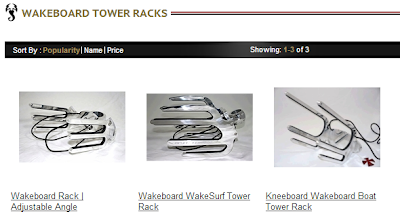 We are selling a ton of wake racks, wakesurf racks and wakeskate racks for home storage and display, but want to let you know that we also have wakeboard tower racks to store your wakeboard on your boat while you are cruising around and ripping it up. Wakeboard Tower Double Swivel Rack: this is a serious, quality tower rack that gives some immediate pop to your boat. 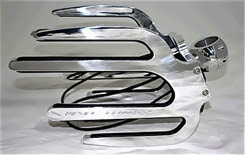 It's made of polished bullet aluminum and so looks very sharp. Of course, the aluminum is lined with rubber so that your extra wakeboards don't get dinged up while you try to recreate Phil Soven's contest runs. The wakeboard rack's tower clamp has a built in swivel on the back plate so you can mount it on any angled piece of your tower and still have your wakeboards line up horizontally, which is very important for the tower designs on new boats. Also important, measure your wakeboard tower tubing size so you pick the right clamp size from our drop down menu. Wakeboard and Wakeskate Triple Tower Rack: this rack is very similar in design and functionality to the rack above, but the huge bonus is more storage capacity. 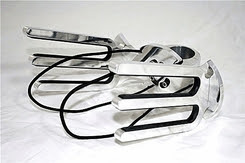 This rack has 4 claw arms to create 3 storage spaces for wakeboards and wakeskates, while the rack above has only 3 claw arms and 2 storage spaces. Grab this tower rack to keep the space on your boat free so you can ride on the lake with all your friends.